BAIL HEARING FOR OMAR KHADR – March 24-25 – Queen’s Court Bench, Edmonton Alta. 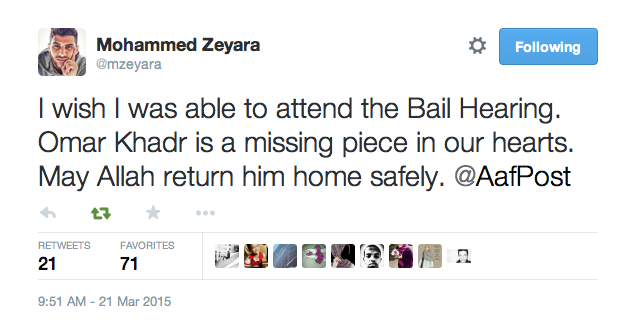 So here we are – two big days – Omar Khadr’s bail hearing. We are possibly less than 24 hours away from seeing that which we have worked for and longed for: Justice for Omar Khadr. Some of you are going to be at the courtroom today to show your solidarity and support, but surely there is some way we can ALL participate in this important day. As important as our posts and letters and prayers are, there is another urgent need that you can all help with. We are calling on every supporter to contribute financially to Omar’s legal defense fund. Dennis Edney has been carrying the load on his own for too long and if you and I don’t step up now and put our money where our hearts are, he may not be able to continue the fight. Consider this week’s bail hearings – months of preparations, court filings, expert witnesses brought from across the continent. This type of effort costs literally TENS OF THOUSANDS OF $ – and this is just the out of pocket costs. Imagine what the opportunity cost of lost revenue to Dennis’ legal practice must be. The challenge to each and every one of you is to show your solidarity with Omar and with Dennis by making a donation today to help pay for these critical bail hearings. Wouldn’t it be great if Dennis only had to worry about the law and not the bills? You can help make that happen – but only if you donate TODAY. Please make your donation via this link: [donation options]. Wouldn’t it be great if we could get every supporter to donate something in the next hours? What a boost that would be for Dennis and for Omar. Imagine how good you will feel on Wednesday afternoon when you see Omar’s smiling face on the news walking out of the courthouse. Now imagine how much better you will feel knowing that your donation played a part in making that possible! And if Dennis and Omar don’t win the day at the bail hearing, imagine how much more they will need your support in order to keep hope and keep fighting. Thank you for giving generously to this important cause.